Welcome to the JustRite 12 Weeks of Christmas Blog hop, week 11. All of us on the Stamper's Dream team are joining in on this one. If you've come here from Stephanie Kraft's blog, you're right on track with the hop. After me, you'll want to head over to Michele Kovack's blog. To start at the beginning, head over to the JustRite Inspiration Blog. For this hop, we were asked to make things to give as gifts. I made this bookmark with my aunt in mind and I think I'll give it to her for Christmas. I used the new Simple Blessings cling set. The stained glass oval was cut out by hand and popped up on foam tape. Note: The actual stained glass stamp has a rectangular border around the oval. I didn't use that part on my bookmark. 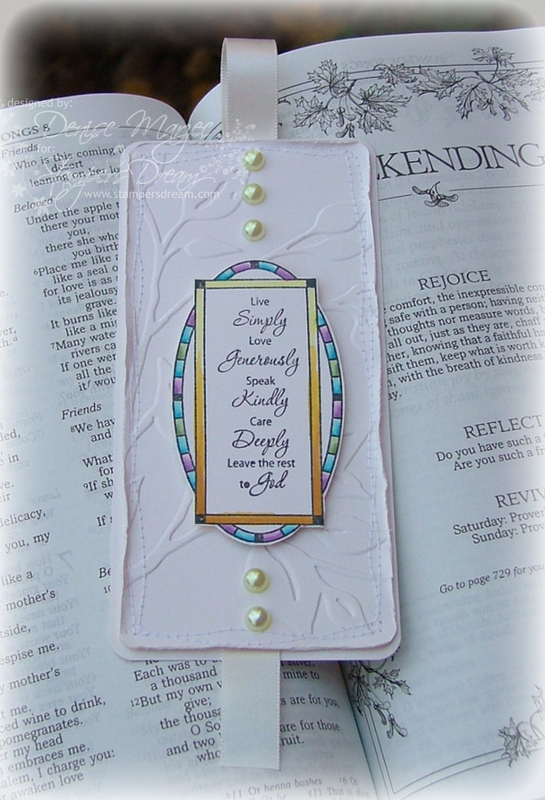 Bookmark Size: 2.5" x 5.75"
Beautiful, Denise! I love the JR Stained Glass and the sentiment. The embossed background and pearls add just the perfect touch! Wow! Denise, your bookmark is gorgeous! Beautiful image. The embossed background and pearls are perfect for it. Simply stunning, Denise! All that white with the pop of color is pure perfection! I love the stunning simplicity of your bookmark. Flat enough to use, and beautiful details. LOVE IT! Have a wonderful day, sweet Denise! So beautiful and gorgeous!!! I adore this lovely bookmark!!! What a gorgeous gift - I know your aunt will LOVE this!!! You rock Denise!!! Love what you did with this bookmarker! Nice design. ooooh, love the embossing and pearls! Such a beautiful bookmark, Denise! It will be a wonderful gift! This is such a pretty bookmark! I just love that embossing folder you used for the background...it is suitable that is for sure! LOVE the stained glass look...beautiful! Woweeeee! This is STUNNING, Denise! Very pretty, your aunt will love this! ohhh...this is such a beautiful bookmark! love the embossed bg and the stained glass!!!!!! This is lovely. SHe will love it. What a gorgeous bookmark, Denise...love the beautiful image and I'm lovin all the white!!!! Stunning bookmark Denise!! LOVE the embossed white bg!! WOW! Such a gorgeous bookmark!! I'm giving some for Christmas gifts too, but their not as pretty! You have given me some wonderful ideas!! Thank you! This is beautiful! It'll make a lovely gift! Stunningly beautiful. So elegant and such a nice gift too. Happy 3rd Birthday, Sweet 'n Sassy Stamps!